Today I will create a Voki to introduce myself. So that I can learn about my classmates. I'll know I've got it when my Voki is 30-60 seconds long and tells others about myself. If you are using the desktop computers in the computer lab, you will need to set up a desktop microphone before you can record. Watch the video below to see how to set up a desktop microphone. What is a Voki? A Voki is a free online tool that allows you to create and personalize a speaking avatar. Day 1: Write a script to introduce yourself. First tell us your first name. Tell us what your tech goals are for this year. Give a few fun facts about yourself. Practice reading your script. It needs to be between 30 and 60 seconds long. Remember don’t share any private information, like your last name, phone number, or where you live. Day 2: Personalize your Voki, Record your Script and save it to your Google Drive. 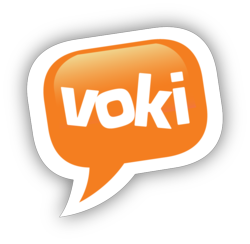 Warning- You will not be able to save your Voki without creating an account. It must be finished before class is over and saved to your Google Drive or you will lose it. 2. Click the “Create” tab at the top. 3. Click on “Customize Your Character” and choose “Head.” Pick your character. 5. Click the “Background” button and choose a background. 6. Click on “Give It a Voice” and then the Microphone icon. Record your voice reading your script. Do not use your last name to keep your identity safe. If you don’t have a microphone you can type your text. 9. Click the Publish button. 10. Log into your Google Drive. Create a new Google Doc. Copy (CTRL + C) and paste (CTRL + V) the permalink and embed code into the new Google Doc.